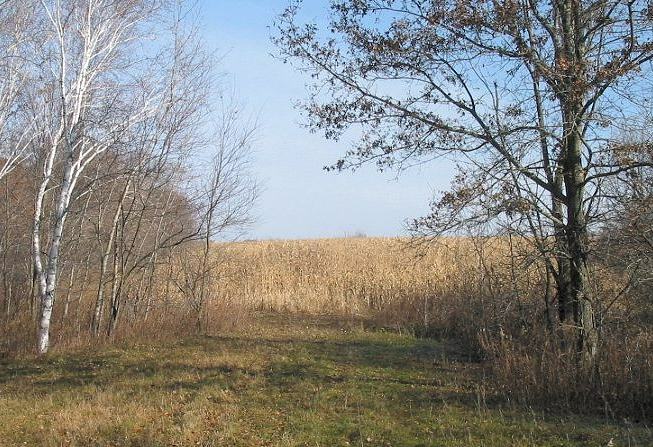 This prairie was planted in November of 2002. It was our first planting using a seed drill. The field had been planted in corn and harvested a few weeks before we planted. This is the view from the Knife Edge path in November just before harvesting. 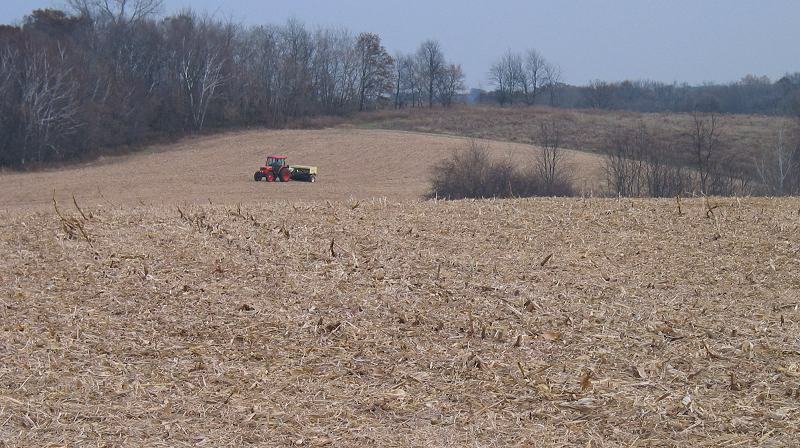 After the corn was harvested, there was so much corn stubble left in the field that Mike mowed it down before we started planting. We borrowed the new Truax drill from the Alma DNR. They had never used it before, and didn’t know much about how it worked. So, we spent a day and a half figuring it out. Here’s Duane working on the drill with Mike in the tractor. Duane helped us hook it up, but when we got it into the field, we discovered that it gathered up the mowed corn stubble into big “snowballs” and dragged them along. Mike had to stop about every 30 feet to clean out underneath the drill. The pieces of corn got wedged in between the metal parts of the drill, and it took lots of pulling and pushing with screwdrivers to get it all out. And Duane didn’t have any suggestions about how to make it work. So, we decided to try using the drill as a broadcast spreader, just driving around and dropping the seeds. Mike started off doing that, and Duane left. I walked around throwing out Needlegrass and Prairie Smoke, things that couldn’t go through the drill. After a few hours, when we thought Mike was almost finished, we discovered that the pipes on the drill had filled up with seeds, and the seeds were dropping out the tops, through the joints and the holes around the turning shafts, but not out the bottoms of the tubes, where they were supposed to be coming out. And the whole machine was plugged up with seeds. It looked like the drill wouldn’t work as a broadcast spreader, and now we had to figure out how to get all our seeds out. The next day was a beautiful warm sunny day, so we decided to try again. We tried planting the field around the septic system, actually drilling the seeds, but the tubes still filled up. Finally we figured out that the phone number for Truax, the maker of the drill, was painted on the side of the drill, and we called Mr. Truax himself. 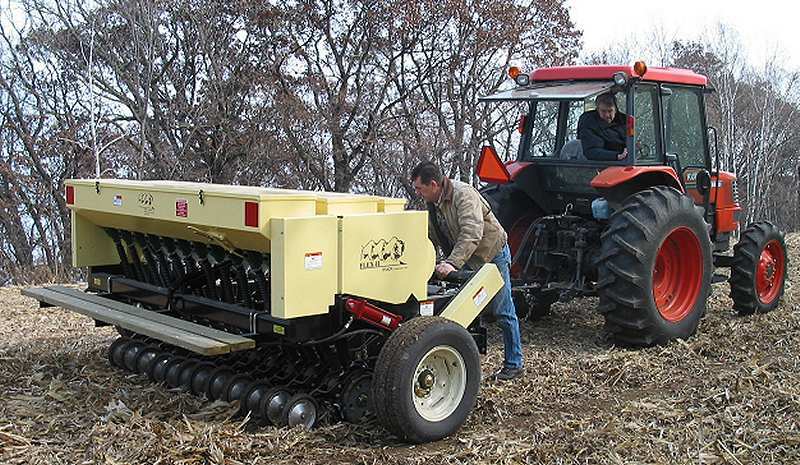 He told us that we needed to clean out all the tubes, which meant taking the whole drill apart; and raise the front cutter wheels, because they are the things that catch the cornstalks. So we did. It took us all morning, but at least we felt we were making progress. We did it in the entrance to the garage, in the sun, and we swept up the seeds from the floor when were finished. When we went back up to the top and tried drilling again, it worked! So, Mike set off, again, to plant the field. We had one more setback – the small tubes, that the smooth seeds fall through, plugged up, but Jim Truax helped us through that one too. It turns out that those small, smooth seeds need to be completely clean. Any sticks or fuzzy things will catch in the tubes and block them up. So we cleaned out the tubes, took the small seeds out, poured them into the big bin on top of the fuzzy seeds, and finished up the field. We didn’t finish until after dark, and we replanted the septic system field in the dark. We planted 77 species in this prairie – 12 species of grass and 65 species of forbs (flowers). I tried to get about 50 seeds per square foot – 16 grass seeds and 36 forb seeds. This is a view from the eastern edge of the field looking west, a few weeks later.